Whenever I get together with my friend JJ deSouza we hyper each other into outer space. You can imagine the fireworks when I revealed to her I had written a work of Jane Austen fan fiction, and she responded she is a JAFF addict. Her shop has a whole corner of “Austeniana”, and she immediately offered to host a book signing and reading. 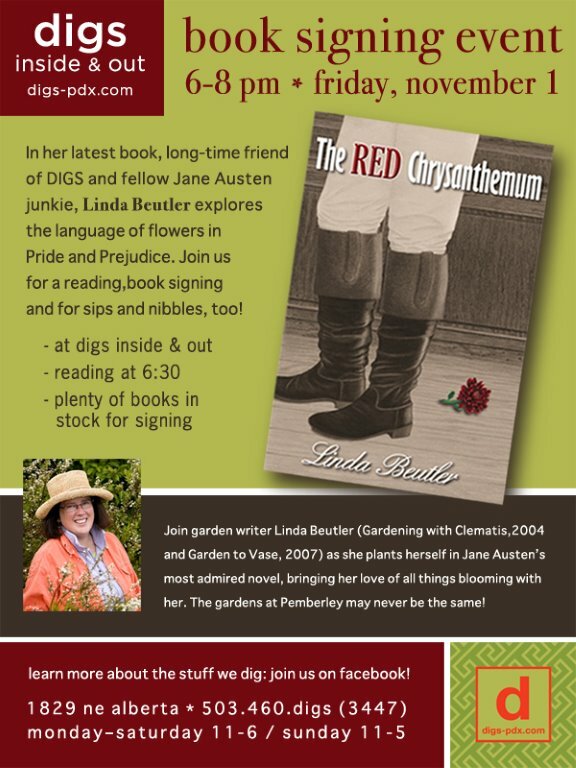 You’ll want to come if for no other reason than to meet JJ, a woman truly worth knowing. Plus, we’ll have tea & espresso and sweet-treats to enjoy. TRC will be for sale, and a limited stock of red chrysanthemum fabric art pins by Miss Kurmudgeon. I got your card this week, thank you! I got the book from Meryton Press a few weeks ago and read it immediately. It was so lovely! I loved to learn more about the meaning of flowers and Darcy was really nice! Thank you! Do you think you’ll be writing another P&P variation? I would love that! You are very welcome and I was happy to send it to you. Yes, I am working on another Pride and Prejudice what-if. The new tentative title is A Will of Iron. Most of the action takes place at Rosings Park. Miss Anne De Bourgh plays a greater role. That’s about all I can say. I am so pleased you enjoyed The Red Chrysanthemum.